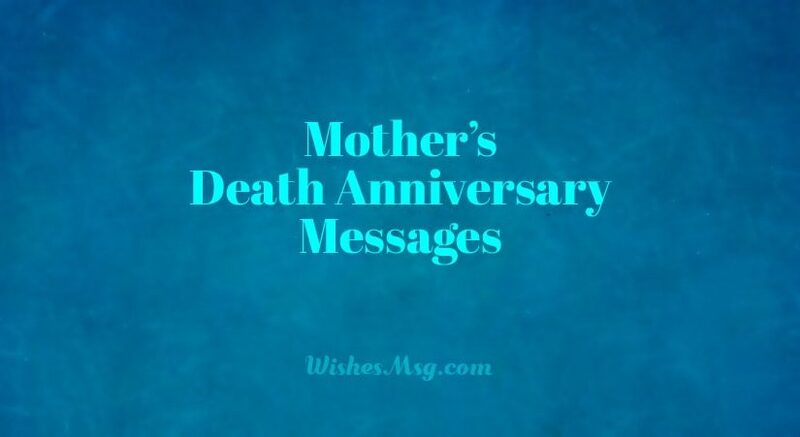 Death Anniversary Messages For Mother : Death anniversary of a mother is a very painful occasion. It becomes very hard to control our emotion when we think about the memories we had with her. But also it is a day to show respect to her for being a wonderful mother that she was. Missing her in every moment after she is passed away is quite a normal feeling, both for a son and a daughter. Remembering mom on her death anniversary in loving memory is a way to show care to her departed soul, also we can express our feelings by some wonderful, emotional death anniversary messages. These remembrance messages can also be great as prayer messages on a death anniversary of a mother. When we express our feeling in words, we can reduce our emotional pain to a great extent. So, check out these Death anniversary messages for mother! I can’t find words to describe how valuable you were to me. The death of you will always remain to be the greatest loss in my life. May God grant you eternal peace. I look back to the days you were with us and I can’t help myself crying. 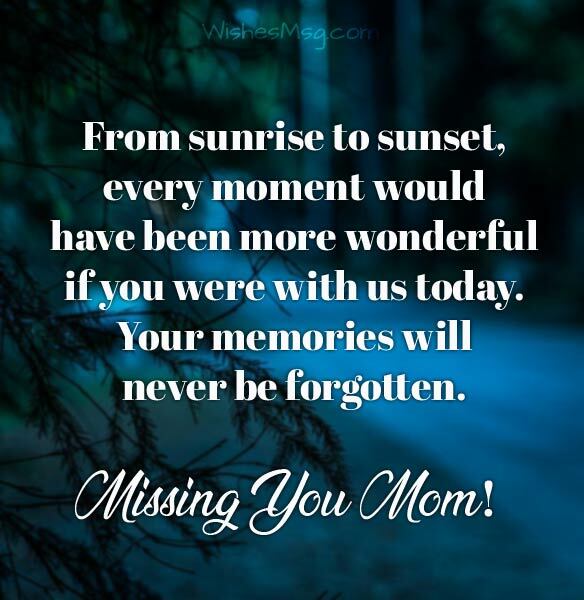 I still miss you so much, mom. You were and always will remain the greatest mom ever. From sunrise to sunset, every moment would have been more wonderful if you were with us today. Your memories will never be forgotten. Everything I am today is what you always dreamt for me. I wish you were alive to see your son living up to your dreams. I miss you! I think about the memories and realize what a wonderful childhood I had. The love and care of a mother are truly incomparable to anything else. I miss you in every moment of my life. A mother is the closest friend a son can ever have. Even after all these years, I feel the need of you in my life. 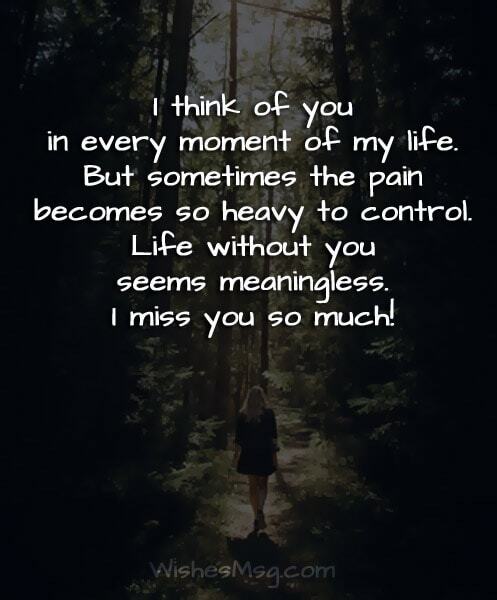 I wish you knew how much I miss you! You were not just a perfect mother but also an amazing teacher. All the good things I have in me are because I saw them in you. You will be remembered forever dear mom. Without your support and inspiration, I would never have achieved all these successes in life. But what hurts me most is the fact that you are not any more to see all these. 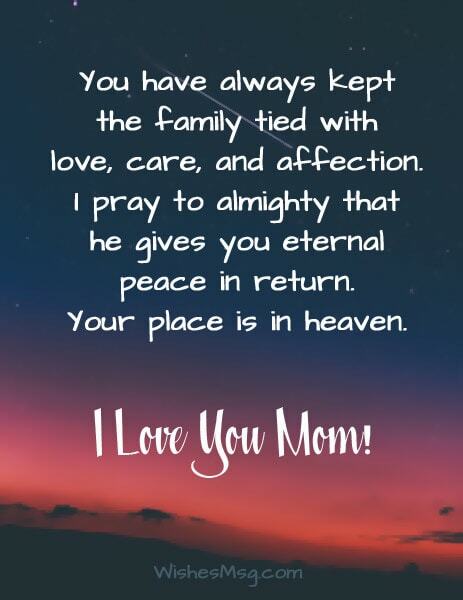 I miss you, mom! I think of you in every moment of my life. But sometimes the pain becomes so heavy to control. Life without you seems meaningless. I miss you so much! Since you died, I have forgotten what happiness really means in life. Every year when this day comes, I cannot hold back my tears anymore. Rest in peace forever Mom! I have learned many things from you but I have not learned how to live without you. But now, I need to learn how to live with your memories. I wish there were secret stairs somewhere so I could climb up to where you are. I have many stories to tell you, mom. Missing you so much on this day! I have realized that no matter what I do I cannot bring you back to us. So, I am praying to god that he keeps you in the most peaceful and beautiful place in heaven. Amen! You have always kept the family tied with love, care, and affection. I pray to almighty that he gives you eternal peace in return. Your place is in heaven. It’s been quite a few years without you mom. I know you have been watching me from heaven all these years. I pray to God that he be kind to you just like you were to us. I miss you so badly even after all these times. I wish you knew that you are always in my thought and in my prayers 24/7. May God keep you happy up there! The day you passed away was the darkest day of my life. I wish someday we will be reunited before god. Till then, May God keeps you safe in his arms. I have never seen any honest and God loving person like you. I always feel lucky to be born as one of your children. I pray that God rewards you with the best thing that only you deserve! I have always thought of you as my second mother. You have blessed me with so many good memories to remember. You will never be forgotten! Only a successful mother can raise a good human being. When I look at my friend, I realize what a wonderful mother you have been. You will always be in our prayer! It’s not just a day for grieving over losing you. It’s about remembering all the good memories with you and paying respect for a great mother that you were for my friend. Time flies fast. Life goes on at its own pace. 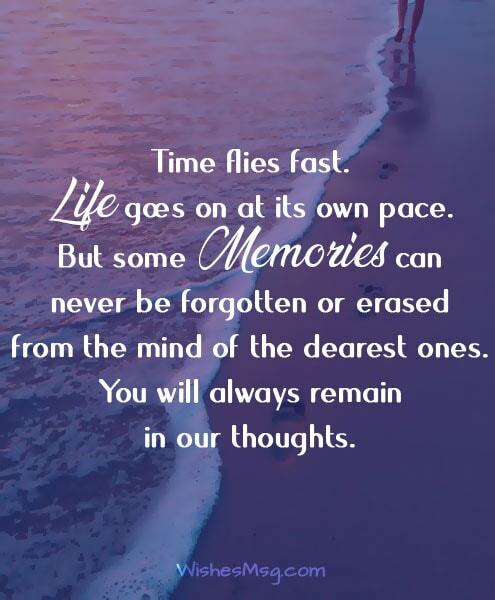 But some memories can never be forgotten or erased from the mind of the dearest ones. You will always remain in our thoughts. You were the perfect role model for how every mother should be to his children. I can still remember the last time I saw you. Memories of you will always have a special place in my heart. People like you should be around us for our entire lifetime. There were just too many things to learn from you. You will always be respected and remembered. Let these remembrance messages be the prayer for your late mother to God. Just remember, death anniversaries are not only for mourning but also for celebrating the person they were.